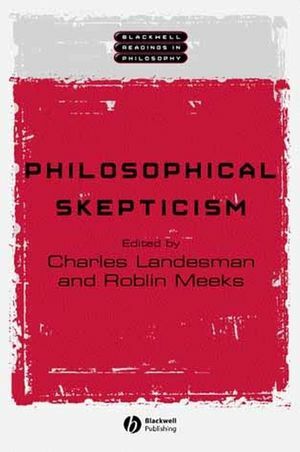 Philosophical Skepticism provides a selection of texts drawn from the skeptical tradition of Western philosophy as well as texts written by opponents of skepticism. Taken together with the historical introduction by Landesman and Meeks, these texts clearly illustrate the profound influence that skeptical stances have had on the nature of philosophical inquiry. Draws a selection of texts from the skeptical tradition of Western philosophy as well as texts written by opponents of skepticism. Spans centuries of skeptical and anti-skeptical arguments, from Socrates to Rorty. Includes essays by Plato, Cicero, Diogenes Laertius, Descartes, Hume, Kant, Kierkegaard, Russell, Quine, Nagel, and many others. Provides a solid foundation for further study. Charles Landesman is Professor of Philosophy Emeritus at Hunter College and the Graduate School of the City University of New York. His previous publications include Discourse and Its Presuppositions (1972), Color and Consciousness (1989), The Eye and the Mind (1993), and An Introduction to Epistemology (Blackwell 1996). Roblin Meeks is a faculty member of the Expository Writing Program at Harvard University. He is currently at work on a book about self-identification. 2. From Pyrrho: Diogenes Laertius. 4. From Outlines of Pyrrhonism: Sextus Empiricus. 5. "Meditation I": René Descartes. 6. From An Enquiry concerning Human Understanding: David Hume. 7. From The View from Nowhere: Thomas Nagel. 8. "A Defense of Skepticism": Peter Unger. 9. "The Refutation of Realism": W. T. Stace. 10. From "Proof of an External World": G. E. Moore. 11. From Sense and Sensibilia: J. L. Austin. 12. From The Theory of Probability: Hans Reichenbach. 13. "Reliabilism and Induction": Michael Levin. 14. "Other Minds": Thomas Nagel. 16. "Knowledge of Other Minds": Norman Malcolm. 17. "Meditation II": René Descartes. 18. "Of Personal Identity": David Hume. 19. From "The Paralogisms of Pure Reason": Immanuel Kant. 20. From Beyond Good and Evil: Friedrich Nietzsche. 21. From Tractatus Logico-Philosophicus: Ludwig Wittgenstein. 22. From "Apology for Raymond Sebond": Michel de Montaigne. 23. From Pensées: Blaise Pascal. 24. "Of Miracles": David Hume. 25. From Concluding Unscientific Postscript: Soren Kierkegaard. Part III: Responses and Reactions:. 26. "Meditation VI": René Descartes. 27. From The Forced Marriage: Jean-Baptiste Molière. 28. From A Treatise of Human Nature: David Hume. 29. From Essays on the Intellectual Powers of Man: Thomas Reid. 30. From Prolegomena and Critique of Pure Reason: Immanuel Kant. 31. From Being and Time: Martin Heidegger. 32. From "Two Dogmas of Empiricism" and "Epistemology Naturalized": W. V. Quine. 33. "Solidarity or Objectivity": Richard Rorty.